This popular veal dish is very easy to make and a family favorite. Start by preparing your side-dish, whether it's mashed potatoes or rice which cook in less than 30 minutes. Wiener Schnitzel´s total cooking time (icluding preparation) will be about the same as your side dish´s cooking time. Dry the veal scaloppini with paper towels. Tenderize the veal on both sides evenly with a meat mallet. Season with salt and pepper on both sides. Prepare three dishes: 6 tablespoons flour in first dish, whisked egg with 1 tablespoon water and 1/2 tablespoons oil (or 1 tablespoon buttermilk or milk) in the second dish and 6-8 tablespoons bread crumbs in the third dish. Coat the veal with the flour on both sides, shake off any excess, dip in the egg mixture on both sides and lastly into the bread crumbs shaking off any excess. Prepare a stainless steel or cast-iron skillet with some canola oil just enough to cover the bottom of the skillet and let it get hot on medium-high heat. 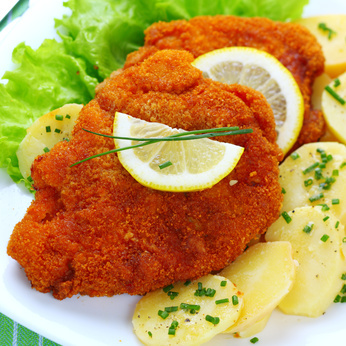 Drop in a few bread crumbs, if the oil starts to sizzle carefully place the Schnitzel inside. Reduce heat to medium. Fry veal until golden brown turning once. Do not cover the skillet. Garnish with lemon slices and parsley.